Ebbinge's silverberry is an exciting plant, perfectly suited to permaculture or woodland systems with so many functions. This hybrid species of garden origin, the result of a cross between E. macrophylla and E. pungens, is commonly grown as a garden ornamental. It produces an abundance of nutritious edible fruit and seed, makes an excellent companion plant due to its nitrogen fixing properties, and provides excellent habitat for a variety of wildlife. It is very attractive with silvery scaled leaves and wonderfully easy to grow. To order this plant please contact us balkanecologyproject@gmail.com. native region and habitat: Not known in the wild, a garden hybrid. 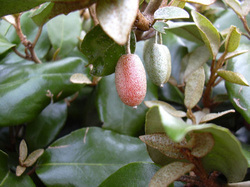 Evergreen Shrub growing to 5m by 5m at a medium rate. In flower from Oct - Jan, and the seeds ripen from April - May. Fruit: Berry; prolific and attractive red berries produced in the Spring. The fruit is very pleasant when fully ripe, otherwise it can be quite astringent. Flowers: Beautifully scented flowers appearing in the autumn. A very easily grown plant.